I HAVE ORDERED THIS BY THE CASE FOR YEARS AND AM READY FOR LOTS MORE!! 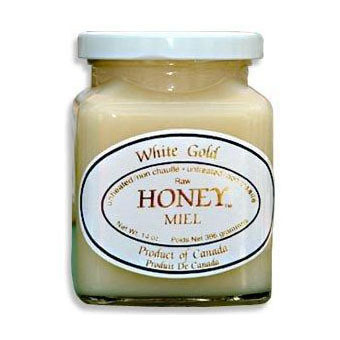 One taste and you will understand why connoisseurs consider Canadian White Gold Honey to be "The World's Best Tasting Honey!" From a remote, pristine environment in Northern Canada, this is pure, unfiltered, unheated, untreated white raw honey, made entirely from clover. Exquisitely mild with a thick consistency due to its extremely low water content, it is a delightful spread for your morning breakfast breads, and an excellent honey for sweetening hot tea. This delicate raw clover honey self-solidifies soon after extraction due to its extremely low water content. Variation in color and texture is a normal occurrence.